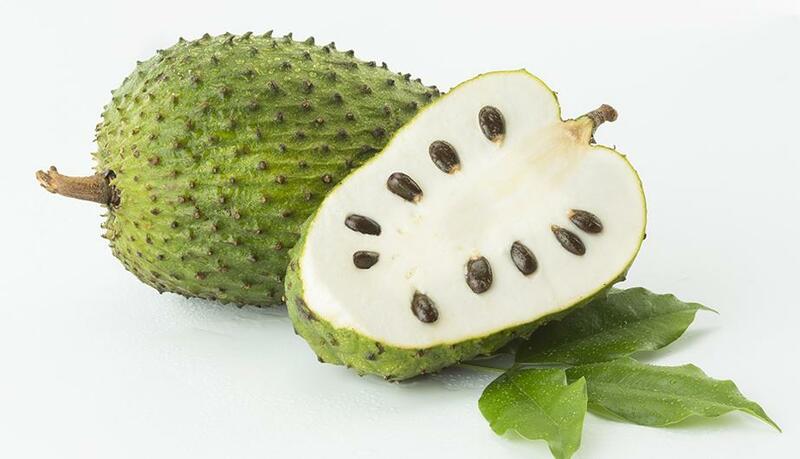 Soursop or graviola (in Spanish, guanábana) and cherimoya or custard apple (chirimoya or chirimoyo also in Spanish), are two different tropical fruits that are often mistaken one for the other. They both belong to the same Family; Annonaceae and are physically similar, however they both have very important differences that set them as two different fruits. Physical characteristics Cherimoya is a heart-shaped, tropical fruit. Its size goes from small to medium, similar to that of a grapefruit. Its skin is smooth, thin and dark green. Cherimoya doesn’t have spines or thorns unlike soursop. However, it does have some lines that mark the limits between each one of the fruit segments that shape the cherimoya. On the inside, cherimoya is smooth and white. As for soursop, it is a delicate big fruit. In average, soursop weights 5.5 lbs. and measures between 7.9 and 11.8 inches long. Its outer color is usually dark green, although it can vary between light green and yellowish- green. Also on the outside, soursop has soft, flexible spines over its delicate, thin skin. On the inside soursop is white. Its texture can be described as smooth, rich, and creamy. Taste It is usually sweet and can be described as a mix between pineapple, strawberry and mango. Flavor-wise soursop is sweet although its sourness prevails. Many describe its flavor as a mix between strawberry and apple. 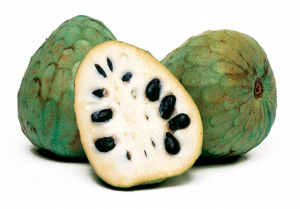 Origins Cherimoya is original from Peru, Ecuador, Bolivia and Colombia. Nowadays it can be found in Mexico, and many other countries in Central and South America. Other countries such as Spain and the USA and regions like the Mediterranean and Central Africa also produce cherimoya. On a very similar way to cherimoya, soursop is original from Southern Mexico, Central and Southern America and the Caribbean. Nutrition Cherimoya is high on proteins. This specific characteristic nutritionally differentiates it from other fruits. It is also high on thiamine (vitamin B1), calcium, iron and phosphorus. Soursop on the other hand is high on ascorbic acid (vitamin C), thiamine (vitamin B1), iron, magnesium and potassium.